By 2050, deforestation in Brazil could increase local temperatures there by 1.45 degrees Celsius (2.61 degrees Fahrenheit), according to a new study. The local increase would be in addition to the overall rise in temperatures due to global climate change, said coauthor Barry Sinervo, professor of ecology and evolutionary biology at UC Santa Cruz. "When you think about the cooling effect of forests in the context of climate change, the effect on local temperatures is really important," Sinervo said. "I was very surprised by the impact of these deforested patches on temperatures in adjacent patches of intact habitat. That should be alarming." Using recently released data on global changes in forest cover, the researchers developed a new model to quantify how those changes affect local surface temperatures. Their results, published March 20 in PLOS ONE, showed that tropical forests are particularly sensitive to the climate effects of changes in forestation. Forests are known to reflect less sunlight and have higher evapotranspiration (water loss from vegetation to the atmosphere) than open vegetation, which means that changes in forest cover can affect local land surface temperature. Until recently, however, the high-resolution global data needed to quantify this effect was limited. For the new study, researchers led by first author Jayme Prevedello at Rio de Janeiro State University compiled a global dataset from 2000 to 2010 to quantify the impacts of forest change on local temperatures. They used newly-released data on forest cover, evapotranspiration rates, sunlight-reflection (albedo), and land surface temperature and built a model to quantify the relationship between these variables for tropical, temperate, and boreal regions. The study found that deforestation and forestation generally appeared to have opposite effects of similar magnitude on local temperature. However, the nature of the effect and the magnitude of the temperature change depended on latitude: in tropical and temperate regions, deforestation led to warming, while forestation had cooling effects. In boreal regions, deforestation led to slight cooling, though the magnitude of the effect was smaller. The magnitude of the forest change effects was greatest in tropical regions, with, for example, deforestation of approximately 50 percent leading to local warming of over 1 degree Celsius. 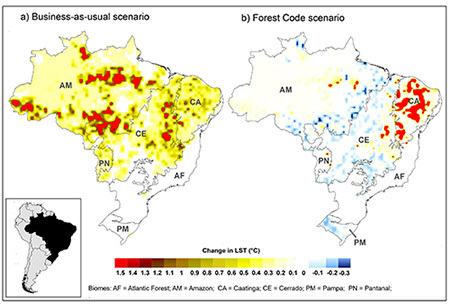 The authors used their model to predict local temperature change in Brazil between 2010 and 2050. 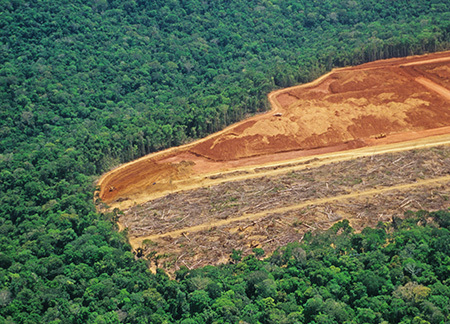 Assuming the current rate of illegal deforestation is maintained, this predicted an annual land surface temperature rise of up to 1.45 degrees Celsius in some areas by 2050. However, if no further illegal deforestation occurred, the temperature rise could be far more limited. "Forests have the potential to attenuate the levels of local warming even in the face of ongoing climate change, but this is most pronounced in tropical regions compared to temperate regions of the world," Sinervo said. "We have many biodiversity hotspots in tropical regions of the world, so forest protection and reforestation are key strategies we can put in place to protect biodiversity right now." Sinervo led a 2010 survey of lizard populations around the world that found an alarming pattern of population extinctions already occurring due to rising temperatures. He subsequently led an international collaboration to investigate how climate change is affecting plant communities and animal populations around the world. Through this work, he made connections with Brazilian researchers, including coauthor Gisele Winck at the Federal University of Rio de Janeiro. "I have been all over Brazil, including a long trip along the 'arc of deforestation,' and it inspired us to get these big data visualizations going," Sinervo said. The new model quantifies the effect of forest change on local surface temperatures through changes in sunlight-reflection and evapotranspiration. The results for Brazil provide a case study showing that current land use policies can significantly affect local climate in the future. In addition to Prevedello, Winck, and Sinervo, the coauthors of the paper include Marcelo Weber at the Federal University of Rio de Janeiro and Elizabeth Nichols at Swarthmore College and the University of São Paolo.